We can easily imagine any color we have seen at some point in life (e.g., white, black, rainbow colors). But what would it take one to understand and "see" a new color? P.S. : There are more colors than we see, aren't there? "Suppose, therefore, a person to have enjoyed his sight for thirty years, and to have become perfectly acquainted with colours of all kinds, except one particular shade of blue, for instance, which it never has been his fortune to meet with. Let all the different shades of that colour, except that single one, be placed before him, descending gradually from the deepest to the lightest; it is plain, that he will perceive a blank, where that shade is wanting, and will be sensible, that there is a greater distance in that place between the contiguous colours than in any other. Now I ask, whether it be possible for him, from his own imagination, to supply this deficiency, and raise up to himself the idea of that particular shade, though it had never been conveyed to him by his senses? I believe there are few but will be of opinion that he can." "Mary is a brilliant scientist who is, for whatever reason, forced to investigate the world from a black and white room via a black and white television monitor. She specializes in the neurophysiology of vision and acquires, let us suppose, all the physical information there is to obtain about what goes on when we see ripe tomatoes, or the sky, and use terms like 'red', 'blue', and so on. She discovers, for example, just which wavelength combinations from the sky stimulate the retina, and exactly how this produces via the central nervous system the contraction of the vocal cords and expulsion of air from the lungs that results in the uttering of the sentence 'The sky is blue'. [...] What will happen when Mary is released from her black and white room or is given a color television monitor? Will she learn anything or not?" Jackson's answer is that she will learn, Mary could not have "imagined" colors on her own no matter how much she knows about them. The difficulty with deciding who is right is that it is unclear how exactly we can determine, in actual experiment, what exactly was "imagined", and compare it to what was intended. This is at the heart of the current philosophical debate about the so-called qualia, private "feels" or experiences. It is also unclear if we can trust subject's opinion on whether the "imagined" missing shade was the same as the "right" shade presented to her afterwards. Wittgenstein had serious doubts that the talk of private sensations is even meaningful, let alone trustworthy, see How does Wittgenstein's argument against recognizing private sensations work? and What is the role of sensations in Wittgenstein's private language argument? See a discussion of both thought experiments in Johnson's How I Got the Blue. For a modern scientific look at color perceptions see Bimler's Psychological Color Space and Color Terms. It seems trivial to imagine something that is almost like blue, but different. Some can even imagine a super-intelligent shade of the colour blue. It does, however, bring up the challenge of defining what a "color" is. Pick the wrong definition, and you find it mathematically impossible for there to be any colors besides the ones we can see. A curious case, however, arises with red-green or blue-yellow. Can you imagine a red-ish green or a blue-ish yellow? They're hard colors to comprehend. In fact, they're called Impossible Colors in the cognitive science world. It is currently believed that our concept of color is built from "opponent processes." Red and green are opponents, so you can only observe one or the other. Same for blue and yellow. This is why alternating lines of them clash so heavily. If you can imagine a reddish green or a bluish yellow, you can imagine an impossible color, which in theory you have never seen. There is some evidence to suggest that it is possible to observe one of these "impossible colors" by having one eye view one color and one eye view the other. It's debatable whether this color actually existed, because it depends entirely on the fusion between the two eyes, and yet some people do insist it exists. Under normal circumstances, there is no hue that one could describe as a mixture of opponent hues; that is, as a hue looking "redgreen" or "yellowblue". Some observers indicated that although they were aware that what they were viewing was a color (that is, the field was not achromatic), they were unable to name or describe the color. One of these observers was an artist with a large color vocabulary. Other observers of the novel hues described the first stimulus as a reddish-green. Curious what such a color might feel like? 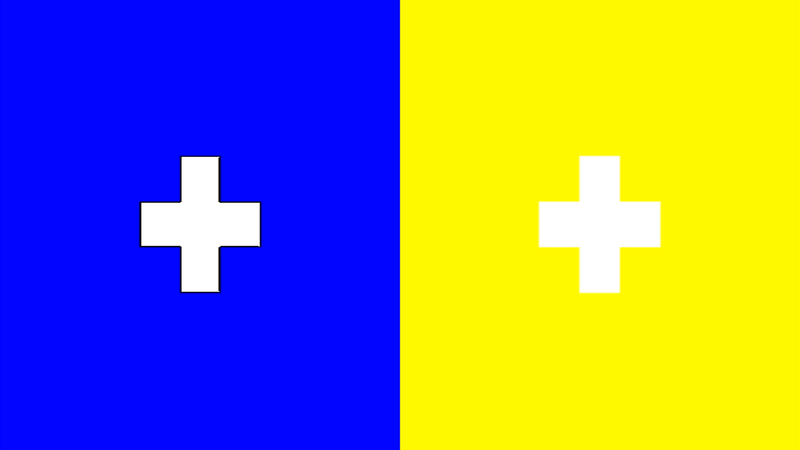 Some people claim that if they cross their eyes such that the crosses in the picture below overlap, they see yellow-blue, an impossible color. Of course, to go much further would start to explore the question of whether color is a "real" thing or an "illusion." Perhaps all colors are, indeed, imaginary. I make such a statement, of course, to tie the answer back to philosophy, but you have to admit that the cognative science side of the answer is rather fascinating! Yes, you can imagine new "colors", and there are physically meaningful complex colors that humans don't really see. We see with our eyes, and those signals go back to our brains. We ascribe "color" to things that we see as colors are common patterns worth noting and exploiting, e.g. for communication. Since this question is about imagining a new color, sure, you can imagine a description that doesn't correspond to anything else that you've seen. In the absence of correspondence to physical reality, this would seem to be a pointless exercise, but there's no reason why you can't imagine it. Additionally, there're physically meaningful "colors" that we actually observe in science labs. However, you can't really "see" these colors directly as the human brain's visual processing center isn't wired to process them. Another answer had mentioned the prospect of tetrachromacy which is sorta how animals with more sensory inputs can see things; they'd have a wider color space. However, this strikes me as a limited perspective because that seems to suggest that there's something special about seeing color in just 4 dimensions. You can perform a Fourier transform on a source of light waves to get infinitely many dimensions of color as opposed to just the 3 in human vision or the 4 in tetrachromacy. We've even built machines that do exactly this, i.e. Fourier transform spectrometers. It's somewhat difficult for a human mind to appreciate such complex "colors" in the same sense that we perceive normal colors though. For example, here's a very high dimensional color for a blue flame. Assuming that this plot uses 1 data point per /nm on the x-axis from 300/nm to 700/nm, then that's a 401-dimensional color. Even if you were to see the blue flame yourself, it'd look blue to your eyes, as your eyes don't have the spectrometer's mechanisms for seeing more. However, you can see the color through the spectrometer's eyes by observing the spectrum showed in the link. If you want to imagine it in your own eyes, it'll look like a blue flame, since that's what it is; but if you want to rewrite how your mind works, you might try to appreciate that it's a far more complex color than just "blue". Science note: The reason that we have such spectrometers is because more detailed colors can tell more about what you're looking at. In many labs, spectroscopy is the go-to method for identifying chemical compounds and other physical samples. When people talk about imagining new colors, I suspect that they're generally looking for something aesthetically pleasing. The problem here is that beauty is in the eye of the beholder; you can imagine a Fourier-transform-like visual apparatus, which would see in vastly more colors than humans normally do, but since imagining such complex colors would require a lot of work and rewiring one's own brain, it's doubtful that an observer would find aesthetic joy in it. Aesthetics seem to work best when an observer can relate to what they see on some level. Unheard of colors, such as high-dimensional colors from spectrometers, probably won't match up to this for most folks. Some people can't perceive colors like normal, i.e. they're color-blind. At least in some cases, this results from the eyes lacking the physical hardware to pick up on some of the color signals. Looking through Google, it appears that some folks are claiming that they're getting close to a cure for some sorts of color blindness, presumably by fixing the eyes. Once a life-long color-blind person has their eyes fixed, will their brains be able to fully process and appreciate the color distinctions as though their eyes had picked up on the signals all along, or will their brains have pruned the unused informational channels? Color space is broad and deep, and the visual system can really only distinguish a little fragment of it. One thing to contemplate here is that we know that the standard-issue human visual system is definitely limited in critical ways. And we don't even have to speculate to see this: tetrachromacy is "the condition of possessing four independent channels for conveying color information". Tetrachromats are able to differentiate colors that appear identical to those without the condition. But they may also be sensitive to wavelengths outside the typical perceptual 'bands'. However, I'm not sure we really know what it would be like for your visual system to "suddenly" start receiving this additional information. At any rate, tetrachromacy points to the fact that color is deep. It seems to me to demonstrate that color space certainly isn't exhausted by the handful of cone and rod types that modern humans happen to have evolved. Note that there's nothing special about three or four channels -- rather than any other number of channels -- for conveying color data. My suggestion is more along the lines that color is a richer quality than any finite set of input channels could convey. "There are more colors than we can see aren't there?" Yes. 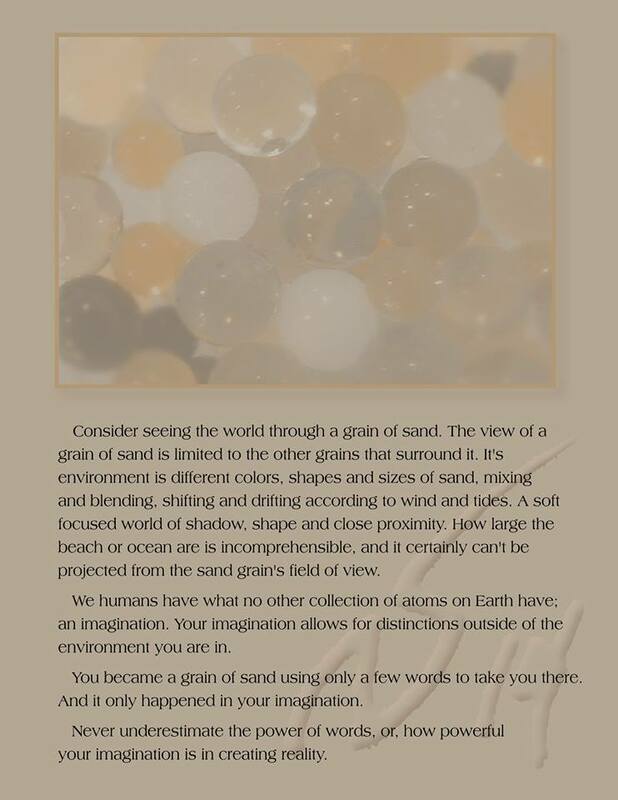 It is relative to being human to be able possess the functions of being able to imagine feelings, spaces, objects, and textures, we have never experienced. There is always the experiential historic senses of color to use as the basis for the unknown color, but if you described gold as a bright shiny yellow, it would still not be gold. Whether or not an imagined color is accurate would depend on the language used to describe it. I will use short exercise I created in 2014 to describe how language creates realities we can only get to through imagination. Not the answer you're looking for? Browse other questions tagged philosophy-of-mind qualia perception or ask your own question. What optical features do we use to distinguish “life” from “non-life”?